The question of how did Peter Pan get to Neverland is answered in the family adventure fantasy Pan. In Pan, Peter (Levi Miller) is a mischievous 12-year-old boy with an irrepressible rebellious streak, but in the bleak London orphanage where he has lived his whole life those qualities don’t exactly fly. Then, one night, Peter is whisked away from the orphanage and spirited off to a fantastical world of pirates, warriors and fairies called Neverland. There, he teams with the warrior Tiger Lily (Rooney Mara, The Girl with The Dragon Tattoo) and a new friend named James Hook (Garrett Hedlund, Country Strong), fighting to defeat the ruthless pirate Blackbeard (Hugh Jackman, Chappie) to save Neverland and discover his true destiny. 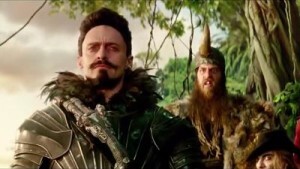 Directed by Joe Wright (Hanna) from a screenplay written by Jason Fuchs, the PG-rated Pan is considered to be a critical and commercial disaster, garnering a lousy 26% positive rating at Rotten Tomatoes based on 154 published reviews and ringing up a soggy $33 million at the domestic box office since opening wide in early October. The Blu-ray 3D Combo Pack features the theatrical version of the film in 3D hi-definition, hi-definition and standard definition; the Blu-ray Combo Pack features the theatrical version of the film in hi-definition on Blu-ray; and the DVD features the theatrical version in standard definition. Here’s the Blu-ray and DVD supplemental breakdown.